Each student will receive a certification of attendance from Olschimke Beratungsgesellschaft mbH. In addition, students can attend one private certification test for a Certified Data Vault 2.0 Practitioner (CDVP2™) as outlined by Dan Linstedt for free. You can select the option “without Certification” in the registration if you do not want to take part (-300 €). This class is officially licensed by the inventor of Data Vault, Dan Linstedt. We are the exclusive partner of Dan Linstedt in Europe. In addition to the 3-day on-site training, there is a computer-based training of the Data Vault 2.0 Boot Camp which is only available online and has to be passed before the on-site training starts. These online training gives an overview of the general knowledge of Data Vault 2.0 and covers especially the methodology, one fundamental pillar of Data Vault 2.0. “Building a Scalable Data Warehouse with Data Vault 2.0”. 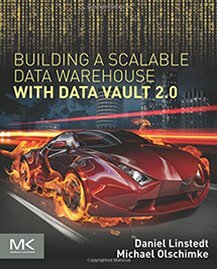 This class has been developed by Dan Linstedt, the inventor of Data Vault, and is taught by Michael Olschimke, his co-author on their best-selling book on Data Vault 2.0. This class is held in German! However, the course materials are in English. You are certainly interested in Visual Data Vault. Learn more about this visual modeling language and download the Visio stencil for free. Extend your early bird discount until last minute! Only valid until September 21st, 2019.